We are pleased to announce the opening of our newest exhibition, Hoplore: Hop Culture in Oregon. Hoplore celebrates the history, traditions, and regional cultures linked to the hop plant. Hopflowers, best known as a flavoring and stabilizing ingredient in beer, have played a critical role in Oregon’s agricultural heritage for more than 150 years. The cultivation of hops has brought together diverse peoples to plant, harvest, and brew this unique botanical, which is also associated with a range of folk remedies for insomnia, indigestion, and various other ailments. 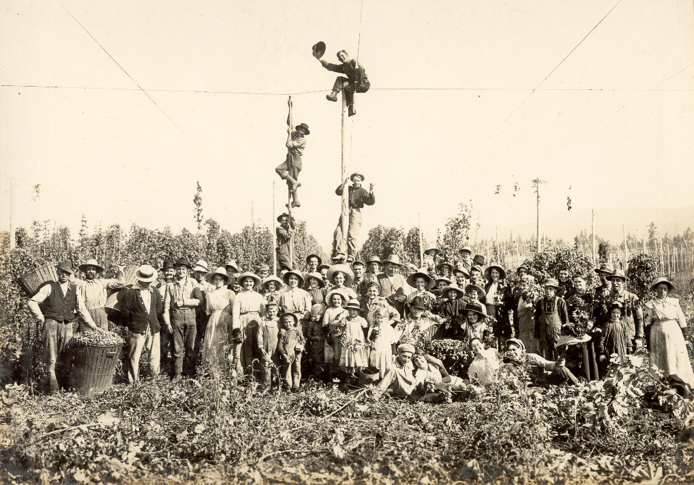 Hoplore: Hop Culture in Oregon traces over 150 years of hops cultivation in Oregon through worker profiles, farm tools, historical photographs, and a short documentary. While Oregon’s heritage hop yards are 3rd and 4th-generation family businesses, small hop farms are enjoying a renaissance throughout the Willamette Valley, revitalizing and re-envisioning hop cultivation and its traditional practices. Makaela Kroin, a graduate student in the Folklore Program, curated the exhibition, which has been part of the research and fieldwork for her degree. To view Hoplore: Hop Culture in Oregon, visit OFN’s Window Gallery on the second floor of University of Oregon’s Knight Library in Eugene.